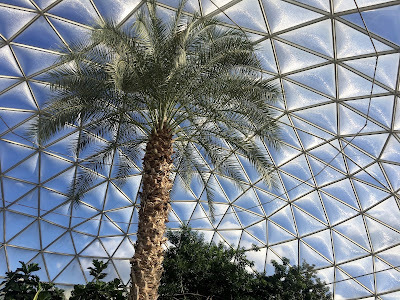 I have had Epcot's Behind the Seeds tour on my to-do list for literally years. Which is ridiculous because it's one of WDW's cheapest, easiest to book tours ever. But that very accessibility is what makes it so easy to skip when other things come up, you know? 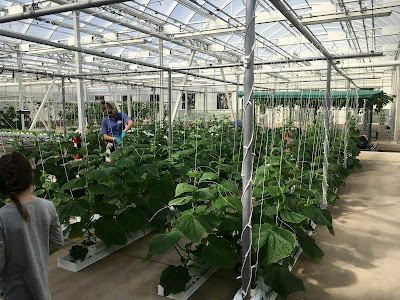 This time around I was absolutely determined to take this tour of The Land's greenhouses, and I dragged my mom along for the ride. We checked in for the tour at the desk by Soarin', where we were given hand-drawn name tags. I noticed that some people had elaborately designed name tags, whereas some had otherwise plain name tags save a Mickey-dotted "i" if the name happened to contain one. I deduced that this was determined by whether or not you had booked in advance. Either way, I enjoyed my snowman in a Mickey hat. 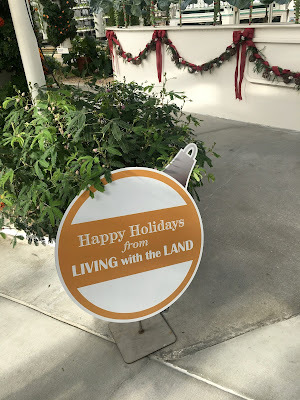 Our group was picked up by our tour guide and took us through a side door behind the Living with the Land boat ride, where she distributed headphone packs that enabled us to hear her spiel regardless of our place in line. Regarding our guide: she was good. Very pleasant, very nice, very knowledgeable. But to be frank. she was also kinda bland and flat - her delivery didn't have much personality. There were no young kids on our tour, and maybe it's different with a different guide, but if there had been I bet they would've gotten real antsy real fast. Anyway! After receiving our headphone packs, we proceeded into a small room containing bugs and plants. Our guide explained that scientists are experimenting with using one type of insect to curtail populations of another, thus cutting down on the need for pesticides. This was all well and good, but we next got to the real meat of the tour: the portion you can see when you're riding Living with the Land. We stepped through a door, and ta da! 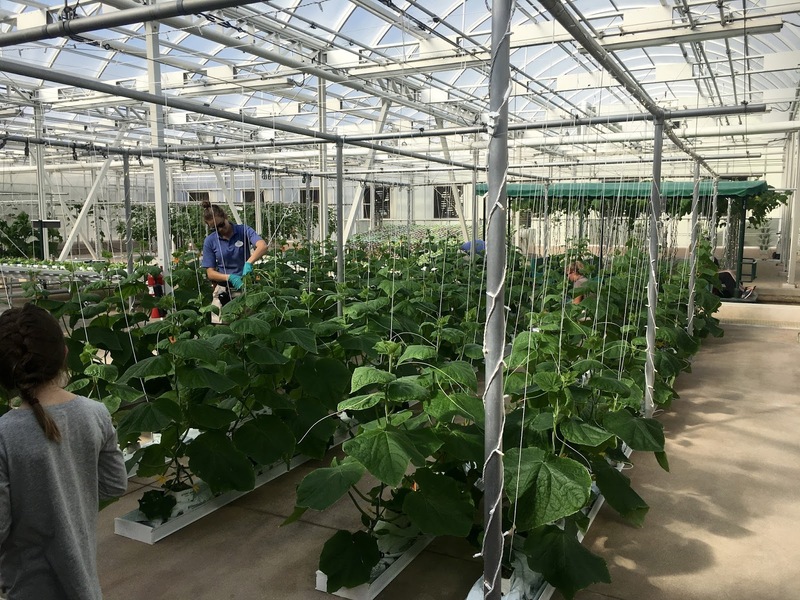 We were in the ride's greenhouses. 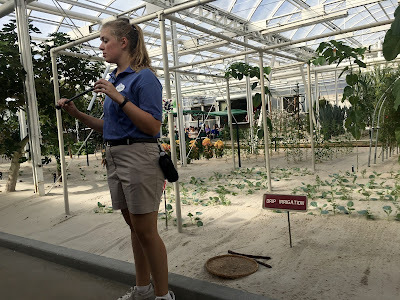 Our guide noted some of the methods Epcot uses to grow crops before taking us over to a small station with a refrigerator and sink. She offered us all a piece of The Land-grown English cucumber, and I gotta say it was pretty delicious - much tastier than the large cucumbers you get at the grocery store. After that we went into the fish tank area, where we checked out the catfish in particular. One particularly interesting tidbit: our guide told us the catfish are unusually snuggly, and will rub up against you if you get in to clean their tank. I asked if this seemed affectionate or just happenstance, and she said she wasn't sure. In conclusion, I should probably get myself a catfish and see if I can convince it to be my friend. Next we moved on to the tropical greenhouse, where many exotic and familiar plant specimens were pointed out to us. The highlight was the spice display, where our guide gave us containers full of spices to attempt to sniff and identify - cinnamon, clove, etc. And then the tour ended. Look, this probably wasn't super exciting to read. To be honest, it wasn't super exciting to experience, either. It definitely had interesting bits, and it was definitely fun watching the ride boats go by while actively on the show floor. But overall I was kind of underwhelmed. Have your done the Behind the Seeds tour? Did you like it better than I did? I've read plenty of rave reviews so I don't know what happened! This has been on my list forever too! My parents did this in November and loved it! Awww, man, they must've gotten one of the good guides!